Located in a small fishing village on the western coast of Palawan in the Philippines, Sabang Beach is framed by mountains and lapped by calm waters. The nearby Underground River—a UNESCO World Heritage Site and one of the New Seven Wonders of Nature—is famous for its stalagmites and gaping caverns. Sabang Beach is situated midway between Puerto Princesa and El Nido, making it a great place to stay overnight to break up the long and winding journey. Unlike many of the beaches in nearby El Nido, Sabang Beach is pristine and generally devoid of crowds: You’re likely to have it all to yourself. From Sabang Beach, you can charter a private fishing boat to take you to Isla Reta, an untouched island surrounded by clear waters. 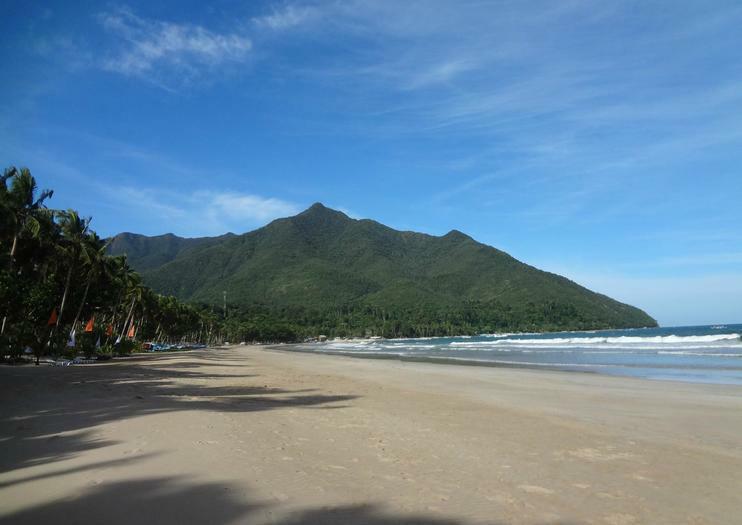 Sabang Beach is a great place to escape the crowds of Palawan. A jungle backdrop means that mosquitoes are rife, especially during sunset, so ensure you wear plenty of bug spray. Visitors can also soar over the ocean on the Sabang Zipline, explore caves and mangroves, or cool off at Sabang Falls. Along the beach, stalls sell fresh coconuts and water. If not arriving as part of an organized tour, you can take a shuttle van to Sabang Beach from the San Jose Terminal in Puerto Princesa. The journey takes two to three hours. If you’re planning to continue north to El Nido, several shuttle buses depart from Sabang daily and take around three hours, depending on traffic. Sabang remains relatively devoid of crowds throughout the year, making it an ideal spot to escape the stress of modern life. Locals agree that the best time to visit the Philippines is from February to April, when monsoon season has passed and the weather is relatively dry albeit still unpredictable. If you’re visiting Palawan, exploring the Underground River is a must. Booking an Underground River tour independently involves obtaining permits and long wait times for boats. Travelers can avoid this by booking a day tour from Puerto Princesa—despite the river’s name, its access point is in Sabang, 25 miles (40 kilometers) north of Puerto Princesa—which typically includes hotel pickup and drop-off and a buffet lunch. Discover the Unesco-inscribed underground river and its amazing rock formationsEnjoy a boat ride alongside mangroves and tropical rainforestDig into a buffet lunch of local specialtiesThe Puerto-Princesa Subterranean River National Park is home to a spectacular limestone karst landscape and the famous underground river. Declared a Unesco World Heritage site in 1999, it has “some of the most important forests in Asia” and is a “significant habitat for biodiversity conservation”.During this whole day tour from Puerto Princesa City, we will drive around two hours to Sabang Port. On the wharf, we will board a boat to Sabang Beach, the entrance to the actual underground river. Helmets and life jackets on, you will then float into the entrance of “one of the world’s most impressive cave systems”, which flows directly into the sea. Each group is assigned a boatman with paddle boat equipped with a searchlight, as you will lose sight of the sun for quite a while in there. No vacation in Palawan is complete without a visit to the Puerto Princesa Underground River, a UNESCO World Heritage Site formed over millions of years. This private tour allows your group to customize your itinerary according to your interests: add activities such as ziplining or time on the beach, or opt for a super-fast trip that ensures you're back in time for your departing cruise ship. Plus, stress-free hotel pickup and drop-off are included.